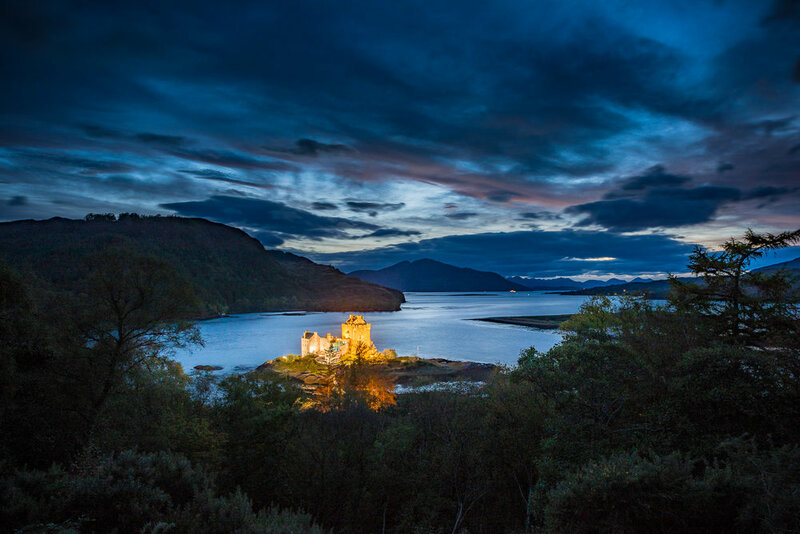 Join David Rosenthal and our veteran Scottish guide Paul Tomkins, as we photograph and explore some of the best that Scotland has to offer—the Isle of Skye, The Highlands, and Cairngorms National Park. For ten days we'll photograph the beauty of Scotland, from the Hebrides to the forests, glens, mountains, lakes and more. We promise to get you to the right spot, and maximize the best light available to us. While we work on the art of seeing and composition in the field, we'll also teach shooting for HDR, panoramas, black and white, and more. We will feature image review sessions and our post-processing workflow in Lightroom. We won't waste a moment—like we say, "we put the work in workshop!" Expect to be up early, and out late. With clear weather, we may even photograph the night skies! October 18, 2018: Arrive in Glasgow, Scotland this day. We’ll meet at 6:00 PM for introductions and a group dinner. October 19–21, 2018: After breakfast, we’ll head out on our adventure, stopping at some of the beautiful lakes and scenic spots on our way into the Highlands. We’ll stop over in Glencoe, to photograph the beauty of the Scottish Highlands. 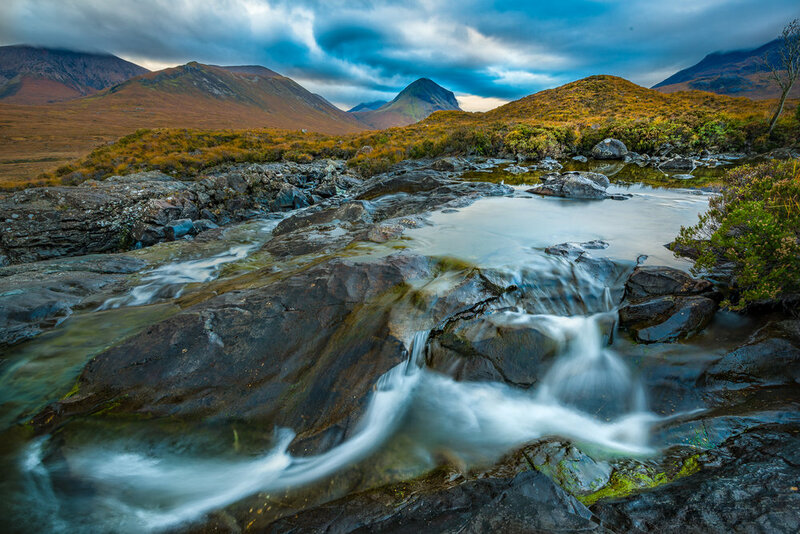 Our base at Kings House Hotel affords us easy access to all of the streams, lochs, moors, and mountains that we want to photograph: Lochen na h-achlaise at Rannoch Moor, Loch Baa, Buchaille Etive Mor (“the Buckle”), The Three Sisters of Glencoe, and more. October 21–24, 2018: We leave the Highlands for our base on Skye, the Sligachan Hotel. En route to Skye we will stop at Eilan Donan Castle. Along the coast and islands, the sense of isolation, and perhaps even vulnerability, combines with our desire to explore and experience ‘the edge effect’. The Hebridean islands off the northwest coast of Scotland are very much on the edge. Atlantic Ocean waves pound the white sandy shores, shifting and shaping the sands of the Skye. We will spend three days and nights on Skye, photographing its geological wonders. The Old Man of Storr, the Trotternish Ridge, Elgol—all iconic locations for the landscape photographer. We'll be out before sunrise, and after sunset to catch the magical light that falls on this most primeval of landscapes. With luck we will have some clear skies at night to shoot the stars! Techniques we will teach and reinforce include: use of ND Filters for creative effects with waterfalls and seashore, shooting (and processing) for HDR, panoramas, and more. We will work with you on the art of composition, and the science of proper exposure. October 24–27, 2018: After a morning shoot and breakfast, we leave Skye and make our way to The Cairngorms. The Cairngorms conjure up an upland massif of expansive proportions and a sub-arctic environment. But the landscape of the Cairngorms National Park is far more than that. It encompasses strath and glen, village and farm, woodland, moorland, river, and loch. It has Britain's highest and most massive mountain range, its biggest native forests, spectacularly clean rivers and lochs, moorland and farmland, and a stronghold for Britain's wildlife. As the birch woods of Strathspey turn to brilliant gold and the high tops are dusted with the first snowfall of late autumn, the Cairngorms National Park becomes a nature photographer’s paradise. Ethereal mists cloak mirror-calm lochs and ancient Scots pines, withered over three or more centuries, stand sentinel silhouetted against fiery sunsets. At this time of the year, the Scottish Highlands is a landscape of captivating beauty, enhanced by a clarity of light unique in the UK. We have exclusive use of a beautiful stone lodge as our base here in The Cairngorms. Travel to and from Glasgow, Scotland. Mandatory Travel Medical Insurance. Optional Trip Cancellation Insurance. Passport, visa fees. Items of a personal nature. Alcoholic beverages. Anything not specifically mentioned as included. Your deposit of $3,000 will hold your space in this workshop. The balance of $3,995 is due by July 1, 2018. All of our standard terms and conditions apply. Need special payment arrangements for your deposit? No problem, just ask us. This workshop with a very small group of only 8 guests fills quickly every year. If you're interested, click the "Sign Me Up!" button and we'll see you in Scotland! Got questions?